This article is about the quest. For the item, see Ash Statue (item). Continue the investigation to find out how and why Varvur received an ash statue. Is this the stuff that dreamers are made of? Speak to Lloros Sarano for duties. 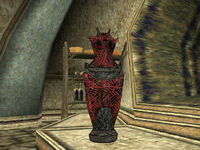 Ask Varvur Sarethi about the Suspicious Ash Statue. Speak with and kill Galtis Guvron. Report back to Sarano and be directed to Hanarai Assutlanipal. Talk with and kill Hanarai. Once you complete Athyn Sarethi's quest to clear Varvur Sarethi's name, Lloros Sarano in the Ald'ruhn Tribunal Temple will ask you to find out where Varvur Sarethi got the Suspicious Ash Statue. Talk with Varvur and learn that he received it from Galtis Guvron at The Rat in the Pot Cornerclub in town (hint: if you ask around the inn before talking with Lloros, he's the one who denies all knowledge). Guvron will attack you as soon as you mention the statue and you'll be forced to kill him. On his corpse you'll find a note signed Hanarai. Talk with Sarano about the note and he'll say he thinks it refers to Hanarai Assutlanipal who has a house in Ald'ruhn. He gives you four Quality Restore Health potions, one Cure Blight Disease potion, and one Cure Common Disease potion, in case Hanarai turns out to be as violent as Guvron. Go in and Hanarai will attack you as soon as you mention the statue. Once she is dead, search her house, and you'll note that her cellar is a Sixth House shrine. The reddish glow around the heavily locked door is a giveaway. Report back to Sarano to complete the quest. After killing Hanarai, visit Dravasa Andrethi's at his house in the city. He is one of the Sleepers, and speaking to him about the "Sixth House" will earn you 1 Reputation point, in addition to the 1 you receive from completing this quest. You can start this quest before finishing the quest to Clear Varvur Sarethi's Name. A key unlocking the door to the basement shrine can be found hanging on the wall in an alcove under the stairs. 10 Lloros Sarano asked me to find out where Varvur Sarethi got the ash statue. 20 Varvur Sarethi remembered where he got the ash statue. He says he got the statue by gambling at The Rat in the Pot with Galtis Guvron. 30 I was told that someone over at The Rat in the Pot had some statues like the ash statue Varvur Sarethi had. 50 Galtis Guvron attacked me when I asked about the ash statues. 60 Lloros Sarano told me to investigate Hanarai Assutlanipal's House here in Ald'ruhn. 80 Hanarai Assutlanipal attacked me when I asked about the ash statues. 100 Finishes quest Lloros Sarano thanked me for stopping the spread of the ash statues. This page was last modified on 4 June 2018, at 10:16.